This Lodge was chartered May 4th 1855. History of this lodge can be found on the History Tab to the left. 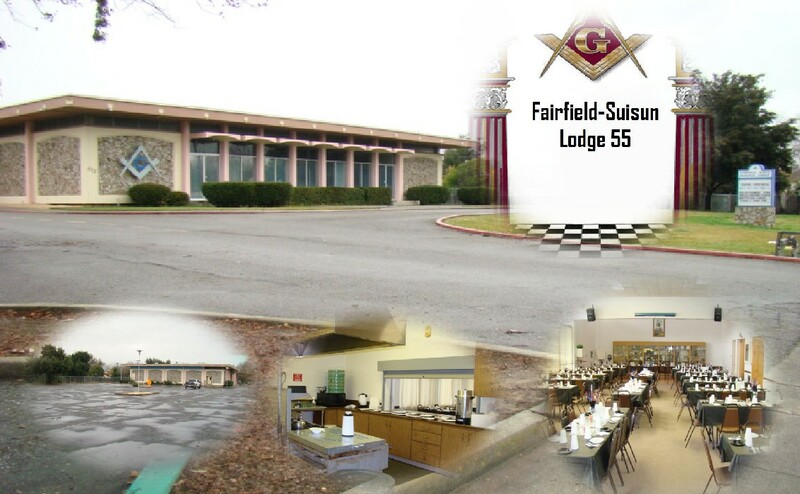 We are also renting this facility at 412 Travis Blvd, Fairfield, California. For more information on the Facility Rental Tab to the left (Rentals for weddings, birthdays, graduations or any special get together) . Stated communications are held the first Friday of each month. Degrees will be on the second and fourth Tuesday and the third and fourth Fridays. Proficiencies will be before each degree. Third degree proficiencies will be stated meetings. Free Mason's contrary to many is a fraternity of brothers just wanting to help one another and better themselves. On the symbol above, the G, stands for God. Another symbol is the symbol of the crossed compass and set-square. The compass and square are architect's tools, and symbolize God as the architect of the universe, among other things. The compass, which is used to draw circles, represents the realm of the spiritual- eternity. It is symbolic of the defining and limiting principle, and also of infinite boundaries. The angle measures the square, the symbol of earth and the realm of the material. The square represents fairness, balance, firmness, etc., which is reflected in phrases such as "on the square" and "squared away." Something that is squared is something that is stable, a foundation for building upon. Together, the compass and square represent the convergence of matter and spirit, and the convergence of earthly and spiritual responsibilities. The two symbols together form a hexagram, the union of earth with the heavens, matter and mind, etc.